The ANA Educational Foundation invites you to apply to the Visiting Professor Program (VPP). In 2019, the program will be held in June in New York in partnership with Fordham University, and will be extended to Chicago in partnership with Loyola University. Professors can apply to one of two programs: the four-day Immersion (in both NYC and Chicago) or the in-depth, nine-day Immersion + Fellowship (in NYC only). Application deadline has now expired. A four-day Immersion into the latest innovations in current marketing and advertising practice. Participating companies will be agencies, marketers and media companies such as: R/GA, IBM, Ogilvy, Facebook, McCann and Wavemaker. Topic areas will include social media, global brand building, consumer insights, the future of media, data analytics and diversity. 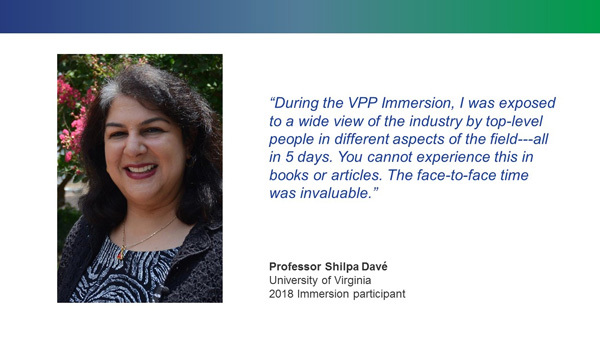 The Immersion is most suited to professors seeking an overview of the latest developments in the field in order to infuse his or her teaching with real-world cases and industry insights. Fordham University in New York City will host a Welcome Session on Monday, June 3, and a research forum during the week. The Immersion will be limited to 30 professors and will be held from Tuesday, June 4 to Friday, June 7. Loyola University in Chicago will host a Welcome Session on Monday, June 17, and a research forum during the week. The Immersion will be limited to 10-15 professors and will be held from Tuesday, June 18 – Thursday, June 20. 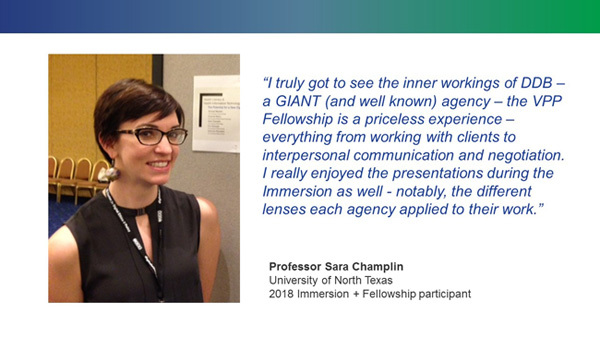 A nine-day program combining the Immersion with a week-long ‘deep dive’ Fellowship hosted by a marketer or agency whose interests align with a professor’s research interest. Given the one-on-one interaction through the Fellowship component, the program is best suited to faculty who have specific questions about the industry that are addressed through more in-depth study. Through this intensive program professors can gain ‘on-the-ground’ experience to inform their teaching with the goal of forming a longer term relationship with their host company. The Immersion + Fellowship will be limited to 10 professors and held from Tuesday, June 4 to Friday, June 14. Accommodations for the VPP in NYC have been made available through a collaboration with Fordham University’s Center for Positive Marketing and will be on campus. Housing will be at the Lincoln Center campus in the heart of the city and is provided at no cost to professors. Accommodations for the VPP in Chicago have been made available through a collaboration with Loyola University and will be on campus. Housing will be at the Baumhart Overnight Lodging located just blocks west of the historic Water Tower and is provided at no cost to professors. Professors will be provided with a stipend of $200 for the Immersion and $450 for the Immersion + Fellowship. All professors will cover the expense of their travel to and from the host city. Please provide a statement (500 words maximum) explaining why you wish to participate in the program(s) selected. Professors applying for the Immersion + Fellowship will be expected to provide a Lunchtime Talk about how your research and teaching relate to marketing and advertising. Please communicate the topic of your Lunchtime Talk in your statement. Contact Sharon Hudson, VP, Program Manager with any questions.